July 23 — The Spiritualist camp at Chesterfield was aglow with electricity last night when the lights were turned on for the first night of the annual camp meeting of the Indiana Association of Spiritualists. A couple of buildings that long stood as “seance rooms” were converted into sleeping quarters. President O’Neil regards the seance rooms a nuisance, he said, and there will be no more built by the association so long as he is president." This is the story of an adventure—an adventure with a purpose. The purpose of this adventure was to record for all time, the truth of a very special type of science in the field of Spiritualism: MATERIALIZATION! While it is a well known fact that materialization is a matter of record in the files of many Psychic Researchers, and we too, have files of photographs to prove it, this adventure with a purpose started out NOT TO RESEARCH, NOT TO INVESTIGATE—but to RECORD ONLY with the most modern technique of the day, the motion picture camera, Infrared lighting and Infrared Film. Used in conjunction with this most modern approach was the OBSERVER-SCOPE called SNOOPER-SCOPE by armed forces. This instrument was used to clearly observe the enemy regardless of darkness at a distance of a thousand feet. When this instrument was placed on the rifle barrel a good marksman could hit the enemy squarely between the eyes in the dead of night. This then was our approach, with permission granted from all parties concerned to the putting on record the great truth of MATERIALIZATION. Psychic Observer secured the services of a man whose stamp of approval on the project would demand a closer look from those who heretofore have openly sneered at the possibilities of this great science. This man, Dr. Andrija Puharich, whom I was lucky enough to catch in between trips in his search for the Sacred Mushroom gladly consented to accompany me on what he considered one of the great adventures of his life! Dr. Puharich secured all the equipment: cameras, film, lights and two Snooper-Scopes, and arrived, after a rough weekend (which is a story in itself) at the Indianapolis Airport, Indianapolis Indiana, Sunday, May 9, 1960. We were accorded a royal welcome at Camp Chesterfield, and word soon got around that we were there to record, for the first time in the history of American Spiritualism, motion picture materialization. The medium was Edith Stillwell and the cabinet attendant, Mable Riffle, (The duties of a cabinet attendant are to see that the séance runs smoothly and to help, with her presence some of the more shaky sitters. Our first three séances were conducted with Edith Stillwell sitting outside the cabinet in the chair normally occupied by the cabinet attendant, and Mable Riffle—who was to act as cabinet attendant, sat back with us in chairs for the sitters. This in itself, Edith Stillwell sitting outside of the cabinet for the materialization, indicated a source of tremendous power and because of this, Dr. Puharich and myself had visions of a tremendous scoop for the Psychic World at large. Our first sitting (Monday) was a sort of get acquainted time because we had not as yet set up all of our equipment. (Tuesday was the day we had planned to start rolling) We went through the standard procedure; said the Lord's Prayer and sang (creaked and cracked are better words) our way through one of the usual hymns. Halfway through (thank goodness) the second chorus, the phenomena started. A gentleman appeared and announced himself as Brother Ben; he was replete with brilliant headgear that seemed to flow down as far as his waist. He philosophised a bit, then turned to the cabinet to personally bring out another spirit with the statement that—it was her first try at this sort of thing and he wanted to be of help in the situation. This creature was gorgeously arrayed in pink ectoplasm and called herself Sister Mary. Both spirits were on the floor at the same time, which gave us a look at everyone in the room; Brother Ben, Sister Mary, Edith Stillwell, and Mable Riffle. This was great! What camera shots we could take! What Proof we could give to the world! Finally, it was announced that the power had run out and that the séance would have to come to an end. In due time the white lights were turned on and we sat back congratulating each other on the wonder of it all. Frankly, there wasn't much sleep for either of us that night. Puharich and I sat on the front porch of the Western Hotel until 2 a.m. planning our camera layout, and when we finally did hit the sack, sleep for me was mighty hard to come by. Little did I know of the great shock for that was in store for me. Morning finally arrived, and after a good breakfast, with more planning of camera angles, we went over to Edith Stillwell's séance room and assembled our equipment which we had unloaded there the day before. I could go into a long and detailed description of the time we had getting our lighting up to par in order to record perfectly all that transpired in the séance room, and actually, we did not start shooting perfect film until Wednesday, June 1st. We discovered that we needed more infrared lighting for crystal clear pictures, and after a BIG search in. Indianapolis, we were lucky enough to come up with two 250 watt infrared lights. This gave us altogether, 1000 watts of pure infrared lighting, which incidentally, does not throw out as much light as the standard 15 watt red lights normally used in a materialization séance room. But let us for the moment return to Monday night's séance. While it is true that we did not record anything on film that night, the Snooper-scope worked like a Snooper-scope should, and Andrija, (Dr. Puharich) saw perfectly everything that transpired in the room. Later, he told me what he saw, and frankly I didn't believe: that the spirits were entering the séance room from a door just adjacent to the cabinet! The discussion grew hotter and heavier; not from Anrija's side, but from my side. I could not, no matter how much I badgered him, get him to admit that he had made even the slightest error of observation through the snooper-scope! Tuesday night's séance, however, was the clincher! This clincher did not come to light though, until the following day. Wednesday, June 1, 1960. We had been quite fortunate in discovering that Indianapolis was the only city in a radius of a 1000 miles that could boast, as one of its enterprises, a firm called FILMCRAFT LABORATORIES. These people process every and all types of film, and processing infrared film, which had been one of our greatest concerns, was second nature to them. Hence, all we had to do was take the film we had shot the night before down to Filmcraft; it was processed on the spot, and we viewed our efforts in their projection room the same day. That is why I say Wednesday was the clincher; this was the day when we were viewing Tuesday night's film. I could hardly believe my eyes! Andrija was right! The spirits were coming from a door adjacent to the cabinet; entering the cabinet through its loose side-curtain, and walking through the front opening of the cabinet to be photographed by us. Little did they know that we were photographing the whole bit! After viewing this ridiculous fakery, my apologies to Andrija for doubting his snooper-scope observations, were not very good, due to my feelings of guilt for my erstwhile good friend, Edith Stillwell and Mable Riffle. Even now, writing this story just about tears my heart out of its socket, but this a story that must be written and the film must be publicized. Being Editor of the Psychic Observer, one of the foremost psychic publications in the world, carries its burden in presenting psychic truths to the world at large. The masthead clearly states TRUTH FOR AUTHORITY, NOT AUTHORITY FOR TRUTH hence, there is no place else to turn. On Wednesday, June 1st, 1960, we were recording movies that were of excellent quality. The séance did not last long, but we got about 30 feet of fabulous pictures. It must be wise to inject here, at no time did we discuss our findings with Edith Stillwell, Mable Riffle, or for that matter, anyone else in or around Camp Chesterfield. We kept the whole thing to ourselves, and while Filmcraft Laboratories knew we were attempting to take motion pictures of the spirits, I do not believe that they were aware of just what action WAS taking place. Thursday, June2, on our regular 8:30 schedule, we sat again. This time Edith Stillwell sat inside the cabinet; (as I have already mentioned, Edith sat for the first three nights outside of the cabinet where she could also, out of trance, witness. some of her own phenomena.) However, absolutely nothing occurred. Neither actors nor spirits showed up. This may be due to the fact that before the séance I had asked Edith if she minded my putting two chairs in front of the curtain that covers the door: (where the spirits had been entering from). I had mentioned that it would look better in our recorded séance if this curtain, which swung back and forth on a single arm, wasn't standing straight out, making it look on film, like a curtained hallway from the door of her living quarter to the cabinet. She agreed to the arrangement, but all we drew was a blank! Edith said that she would try again on the following night which was June 3rd. Andrija and I discussed the point, that perhaps they, Edith and Mable, were onto the fact that we were recording more than they thought we should, but apparently not, for the following night, they even had another medium, Gladys Strohm, to help in the sitting. Mable Riffle said that it would help give more power to Edith. Andrija and I were filled with misgivings. We still had high hopes that we could photograph the real thing; we had also discussed the fact that if this night was a dry run we would just pack up out equipment, and head for home. While we had photographed enough evidence of fraud to upset the whole field of spiritualism for many years to come, we had the thought that, in front of another medium, trickery would not be resorted to. The séance started as usual—prayer, a few hymns, and while we again bogged down on how the tunes should go our 'feelings were good and our thoughts ran high. The Phenomena started before we stopped singing and the motion pictured results of some of the proceedings that took place in the next hour, will go down in history as the greatest recordings of fraud in the history of the movement of Spiritualism. The whole sordid mess is one of the bitterest pills that I have ever had to swallow, and my heart will bleed for a long long time for those poor misguided people, Edith Stillwell and Mable Riffle. It is true, of course, that all mediums are not frauds; there are some very fine ones, and no doubt there are some very fine ones at the Chesterfield Spiritualist Camp, but I for one, will never go there again to seek them out, that is, unless Mable Riffle is no longer in charge of the Camp, and a great sweeping has taken place! Are We What The Scoffers Say We Are? Suppose you were an individual in the foreranks of the movement called Spiritualism. Occupying such a spot, you accepted your position with a grave sense of responsibility, and believing in the truths Spiritualism has to offer. You are anxious to share these with the world. . I suppose a little further—you ponder about how these truths can be most effectively and convincingly presented to the public who is either ignorant of or scornful of them. You need proof, hard, cold, tangible facts—something to sink your teeth into! Suppose after you think, pray and meditate, you decide to take a long chance-a real long chance. BUT, if successful, you will have that hard, cold, tangible proof. What did you decide? A motion picture, via infrared photography, of a materialization and trumpet séance. Incredible you think—maybe even impossible. BUT (the little big word) if successful, what a tremendous impact. Those who come to scoff at such a film will stay to marvel learn and maybe even believe. Suppose you go ahead with this revolutionary idea. You purchase the expensive film.... you engage reputable scientific researchers, as anxious as you are to prove personal survival, to participate in the séance... you obtain the services of mediums who are giants in the field of physical phenomena... you go to work. 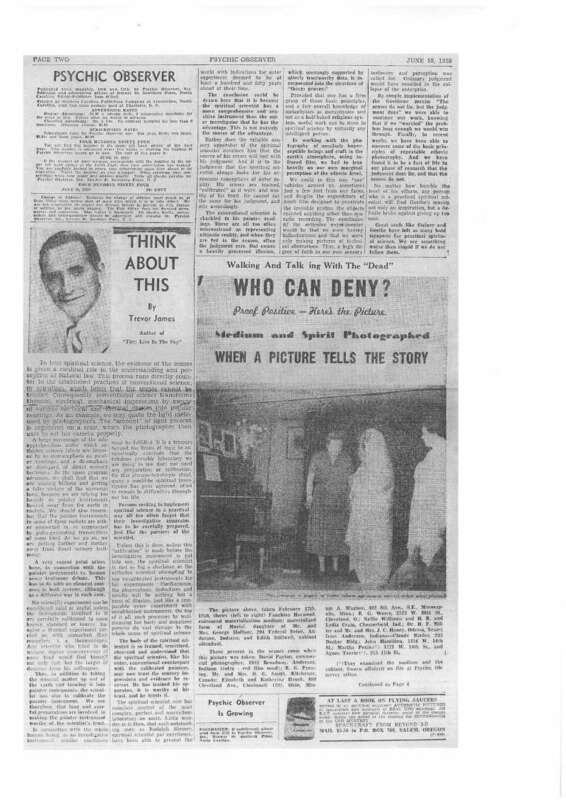 The mediums fully comprehend that the séance is a scientific experiment with an ultimate aim of securing indisputable proof of personal survival after the change called death for a skeptical world. The séance is about ready to begin... cameras are loaded.... one scientist stands by with a snooper-scope....the medium is in the cabinet.... the cabinet tender sits nearby.... the air around you is vibrant with a sense of expectancy and hope... the séance begins. The medium is entranced, spirits materialize, walk around the room, approach you, speak to and with you. All the time the cameras are grinding and the snooper-scope is scanning every inch of the room. And then it is all over. Specially trained technicians develop your precious infrared film...you are enthusiastic to the point of bursting with pride. You are going to do what Lodge, Schrenck-Notzing, Flammarion, Crookes attempted to do. But these men didn't have the tools that you now have—who ever heard of infrared film back in those days. No, you and you alone are going to have that proof so desperately needed for so long. The processed film is returned. You load the filmholder...the projector starts to grind. As it grinds on, you sink lower and lower into your chair.... you annot believe your eyes! It can't be, you say to yourself. It can't be!... But it is. Cameras don't lie. There aren't any materialized spirits—only actors—people popping in and out of partially concealed doors—all quick-change artists waving cotton gauze ectoplasm. Just suppose all this happened to you. What would you do? You tell us.... are we what the scoffers say we are. O'Neill published the pictures and announced the findings as a dark day for Spiritualism. As a result of the exposé, O'Neill almost went bankrupt, as advertisers loyal to the camp pulled their support from the periodical. He relocated his publishing enterprise to North Carolina and for a brief period published under another title. 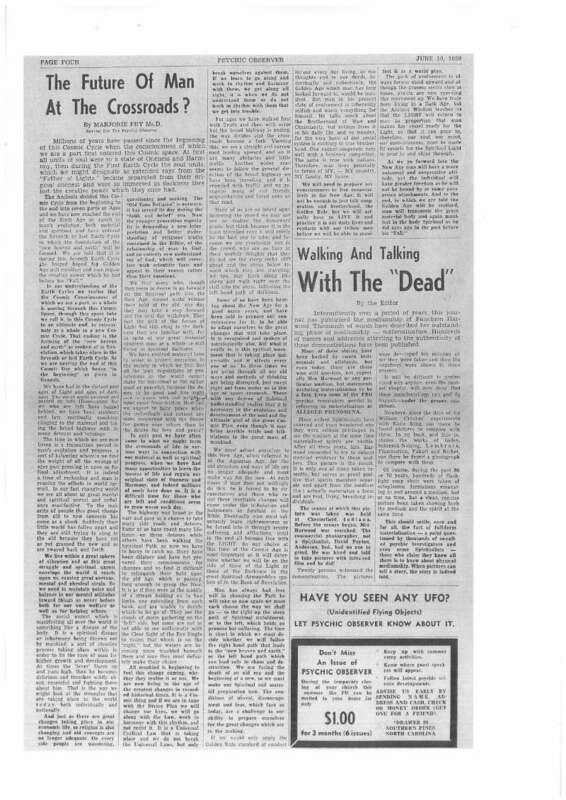 O'Neill died in 1965 and the Psychic Observer ceased publication. Thanks for that Z what a sad tale to share. Then of course Lamar Keene went on to write about his experiences at Camp Chesterfield too. I understand that although the Camp is still open and pulls in visitors the methodology is the same as then and not suprisingly people have some serious reservations about the place. This is the camp that the Medium, Hoyt Robinette, that Merlin asked about, comes from. He is an ordained Minister from Camp Chesterfield. Funny somehow this element is missing from the Camps web history page. This communications empire is presided over by a fast moving, sharp-witted grandmother of 83 who whizzes around the camp on her motor scooter which has been dubbed “The Sputnik.”. For Mable Riffle there is no detail too small to look into personally and no problem too large for her to handle. She handles the cash, keeps the books, and hires and fires the “mediums.” She supervises the construction of new buildings, and keeps architect, builder, and foreman on their toes. She can be seen whizzing around the corners on “two wheels” from sun-up to sundown spotting trouble wherever it arises, and barking out orders with the gusto of a drill sergeant. Yet she has time to drop in on her son, and her grandchildren, and keep track of their smallest needs and their largest problems. Mable's memory is encyclopedic for names, faces, and details. Mable not only manages the Camp efficiently, but she has the surplus time in which to give performances as a trumpet medium to many persons a day. One cannot help but be awed by such prodigious industry, efficiency and energy. One of Mable Riffle's leading stars is a materializing medium, Edith Stillwell, age “65,” who for thirty years has brought comfort to untold thousands by bringing them into face to face contact with the spirits of their deceased loved ones and friends. It was to record the work of Edith Stillwell that Tom O'Neil and I journeyed to Chesterfield on the 29th of May 1960. 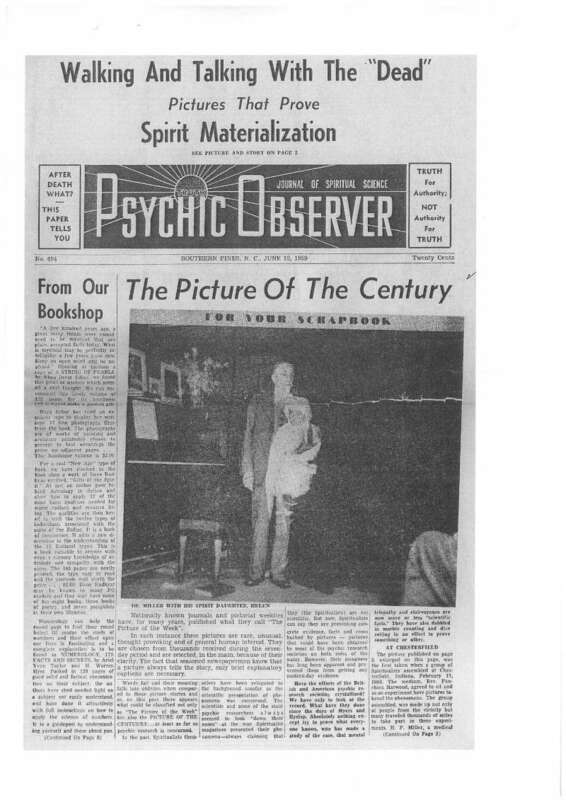 O'Neil is the publisher of the "Psychic Observer." 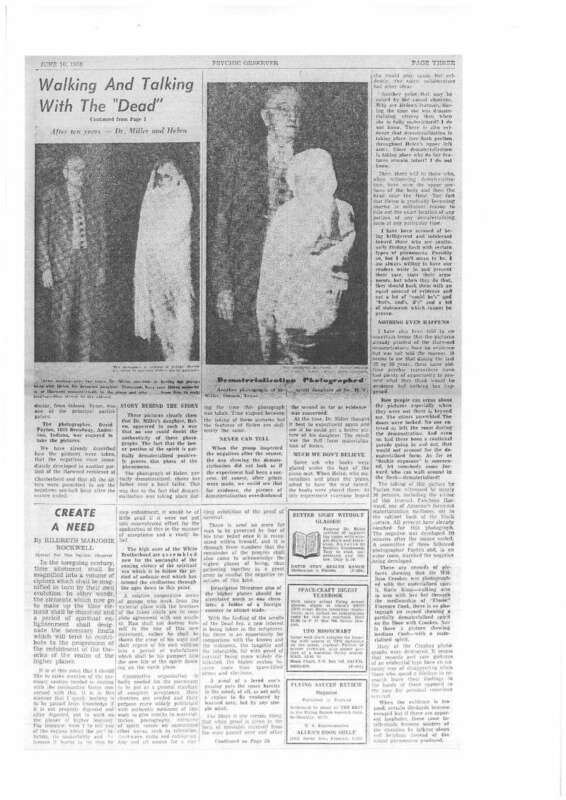 I am glad that the fully formed materialisations I saw at an Alec Harris seance looked nothing like the above pictures otherwise I would have never pursued my investigations into mediumship. I read "The Psychic Mafia" many years ago, too. Can't say I was very impressed. I regarded it as the confessions of a psychic trickster much like William Roy aka Bill Silver in the UK. Thesad thing is that there are still question marks about Camp Chesterfield amongst current US Mediums. I agree about Lamar Keene but it appears the problems at the Camp have been an ongoing issue. Of course the Psychic Observer story is one of the worst on record. Of course the Psychic Observer story is one of the worst on record. No doubt about that. I wrote about it here on Mon Jul 20, 2009.